'CPAP and Ventilator Secrets' is a very welcome self-help book for all users of CPAP and Ventilators. It addresses the common (and some not-so-common) problems, worries and anxieties people have - plus lots of help in using the equipment. It includes experiences and anecdotes from patients, with sections on air leaks, facial soreness, travelling with the equipment, comfort in bed and relationships, amongst others. The book contains no complicated medical or technical jargon and has been written by Marion Maz Mason with Steve B Mason - drawing on Marion's 20 years of personal experience, plus research with other respiratory patients. Marion was a truly remarkable lady, and a huge support and friend of Hope2Sleep and the work we do. She is sadly missed, but her legacy lives on through her books which are still helping people today. "I am not aware of any other book which would provide so much helpful information to people who need ventilatory support." What is NIV and what is it for? 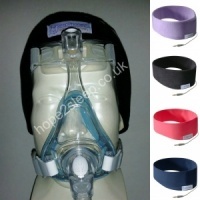 Skin problems and other general health issues relating to Non Invasive CPAP and Ventilation Therapy. Keeping fit with a respiratory condition – how much exercise do you really need to do? (The answer may surprise you). Dating and relationships; in a chapter unique to this book, suggestions for dealing with new or existing relationships with confidence. The ARROW method ; a simple, self-help method for dealing with negative emotions. For those who prefer a digital version it is also available on Amazon for Kindle and clicking on the following Amazon link to purchase will give us a small welcome remuneration towards our charity funds. I had been on BiPap for about a year when I got this book. I found that it covered a lot of things that would have been very useful to know on day 1 - but which I already learned myself within the first 6 months. 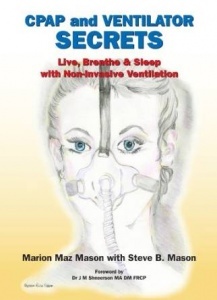 A shame all new users could not get this book as part of their NHS care when starting BiPap/CPAP . As such it wasn't as useful to me a year on. I felt around 80% of the book was useful to BiPap users who needed breathing support which was positive as I wondered if much of it would relate more to sleep apnea. 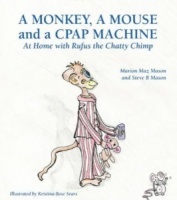 I offer this book as reading material for new carers/assistants who have not worked with anyone on BiPap before. I have found it informative and very useful. I have received the book today and I must admit as of yet I have only got half way through. Already I have found it informative and very useful. It is written in terminology that everyone can understand and relate to. It covers topics that I thought only me had problems with. I am looking forward to reading the rest and will use it to constantly refer to.